Hi Everyone! Happy Monday! I hope the weekend brought you and yours health and happiness. Today I'd like to take a moment to reflect on the intellectual domain of wellness. Intellectual health could also be described as intentionally taking the road less traveled, literally or metaphorically speaking. Intellectual health is the domain of wellness that adds extra sparkle to our lives. It's the sense of adventure that keep our minds and spirits young, creative and curious. How often do you take the road less traveled? During spring break ten years ago, I definitely did not take the road less traveled. I was just another obnoxious American college student partying on the beach in Cancún. My friends and I enjoyed mindless fun for a week and although we made great memories, it was void of any intellectual meaningfulness. I don't remember traveling off the tourist strip once. Yikes! Now I cringe and think about what a waste of time that was. So what changed in ten years? Well for starters, I've traveled by myself in the States, Europe and Asia, which were challenging, but life changing experiences. Specifically, I learned how to be alone, to rely on myself, to trust myself and to ask more questions about what was going on around me. I didn't wait for my friends to get their passport or for my friends to save up money to travel to some all-inclusive resort. I traveled alone and I relied on my ability to make new friends along the way. I traveled to off-beat locations to volunteer my time and energy to help local people improve their lives. Next, I crowd surfed, couch surfed and learned to have trust in the kindness of strangers. Contrary to what pop media would like you to believe, there really are good people in this world! I have met so many gracious, open-minded and interesting people along the way, and it was all because I explored beyond my comfort zone. Then, I learned how to ask for help, seek guidance and take advice and criticism with grace. I learned that the places I've gone and the people I've met have been tests of strength and character along the road of this thing they call "life". Finally, most of my intellectual growth can be attributed to moving overseas and being uncomfortable in my daily life. I cannot tell you how humbling it is to be misunderstood, misjudged, mislead and weighed down with feelings of frustration on a frequent basis. 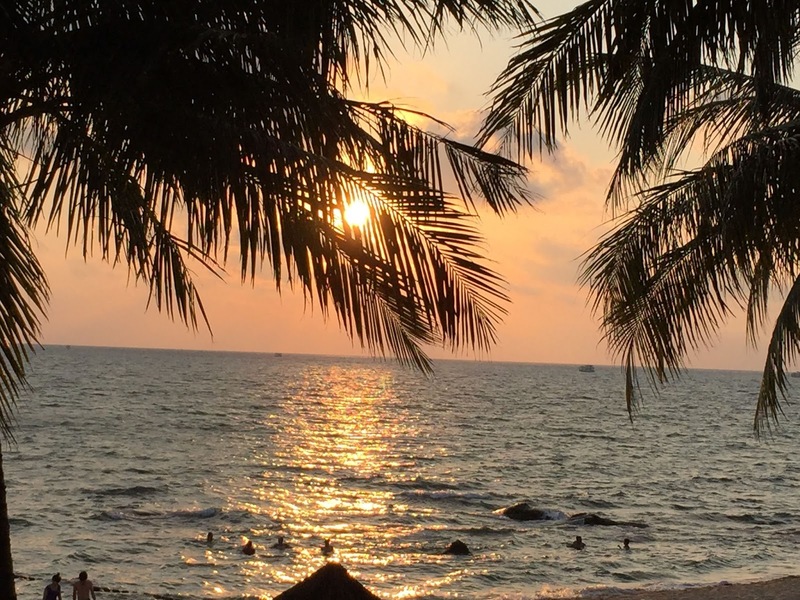 Phu Quoc, Vietnam. Have you ever heard of it? 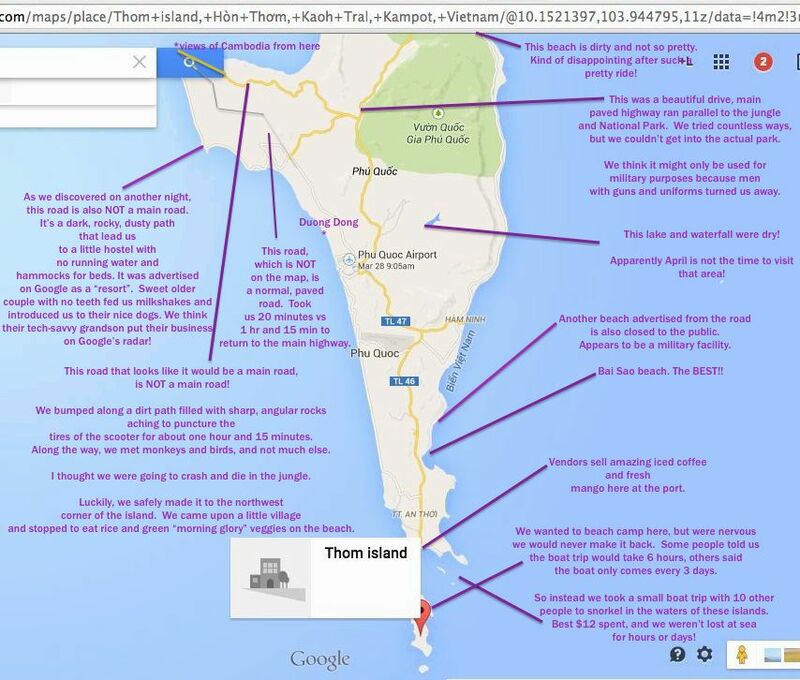 It's a relatively unknown small island in the Gulf of Thailand near the Cambodian border. As excited as I was to travel somewhere new and off the beaten path, I felt a heavy responsibility to be a conscientious traveler, given the relatively recent and very ugly history of the Vietnam War. I'm still so shocked that the people I interacted with were nothing but gracious and kind. I suppose I was expecting more lingering animosity. Perhaps I would have encountered this if I communicated in Vietnamese. You don't really know the stories of the local people until you can communicate in the local language. From an outsider's perspective, the island is beautiful and life is simple, in the most envious way you can imagine. It was very easy to rent a scooter and drive to every corner of the island. Overall, it seems that people live with the bare necessities: aluminum sheets to form walls and roofs of a home, a cooking pot, an open fire to cook food, a hammock to sleep in, some plastic chairs to invite neighbors over for evening television and a large flat screen TV. I think I'd prefer modern plumbing over a flat screen TV, but that's just me. The intention was to beach camp for the week. Despite lugging a heavy tent along for the journey, it went unused. No matter how many people we asked, everyone seemed confused why we wanted to sleep on the beach when there were plenty of nice hotels available. I reserve a special place in my heart for budget-friendly hotels that make atmosphere and style available to normal people. With this in mind, we decided on the Saigon Phu Quoc Resort centrally located in Duong Dong, a "city" on the western side of the island. It was the best decision we made! Starting from the airport, we were pleasantly surprised by Saigon Phu Quoc Resort. After being shouted at by a long line of taxi drivers, "HELLO!! HELLO!! HELLO!! OVER HERE!! HELLO!!" we were overwhelmed! We didn't know which taxi driver to pick --they were all so friendly. Then we found out we had a complimentary transfer to the hotel because the sweet taxi drivers were the ones who informed us (How honest!). The incredible staff of Saigon Phu Quoc Resort were extremely proactive in their approach to service. For instance, when we first arrived, they offered us the use of their pool and beach facilities even before our room was ready and before we were able to check in. At other hotels, we would have been left to wait in a hot lobby for hours. Our first morning, we overslept and we missed the free breakfast, but they offered to keep the dining room open for us, so that we could eat breakfast. At other hotels, we would have been offered the lunch menu and encouraged to spend more money. Later in the week, when we had to change rooms, they moved our belongings for us, to the new room, without us having to ask for their help. They also helped track down a missing pair of shorts that had money inside the pockets, and waited until we arrived to the hotel to hand deliver the missing shorts. Every step of the way, we were met with gracious and genuine smiles. Their wonderful service was also above and beyond the amazing rooms and facilities of the property. 1. Salt, pepper, a piece of red chili and a squeeze of lime juice is THE BEST kind of garnish for BBQ vegetables! 2. "Cam On" is Vietnamese for thank you. 3. Snorkeling with a GoPro Camera is so fun! 4. Banana/Mango milkshakes and the setting sun make a great combination. 5. Google maps can be slightly misleading.